When Numbers Talk: What Defines Success in a Marketing Campaign Report? Not everyone is into numbers—and that’s fair. For some people, the math can be annoying because it’s hard to understand, confusing as hell, and I often wondered if I’d ever use it in my life again (which is why I hated it so much in school). But much like my own math teachers and Shakira’s hips, the numbers don’t lie. As a matter of fact, they can tell us plenty of stories about how well your online campaign is doing; the hardest part is actually listening and paying attention to what they have to say. What Are Canadian Car Buyers Looking For & How Do You Appeal to Them? According to recent Mintel data, Canadians are practical in what they look for within automotive innovations. While they show consideration for innovations that elevate comfort and convenience, they prioritize affordability, safety and reliability. This is where smart communication through our social media platforms comes into play. For each different manufacturer, competitive edge is not only within innovation, but in how they communicate their commitment to meeting consumers needs and wants. Safety Features are always top of mind. Canadians are most interested in the different safety features different manufactures offer in their vehicles. As we find more and more interest in automated features – such as blind spot warning systems and rear and front cameras – dealers must make sure they are mentioning these features while also conveying that consumers should feel safe working with them. Women are becoming more and more involved in the vehicle purchasing process and are showing interest in automotive innovations – especially safety features. However, they remain far less engaged in keeping up with the latest vehicle innovations. With women accounting for over one-third of online discussions around the car buying journey and showing a fair amount of anticipation, it is important to be sure we are still catering to them as an audience as well as what they are looking for in a vehicle. A great example of this is Mercedes-Benz’s ‘She’s Mercedes‘ campaign. More people are also starting to show more interest in Hybrid/Electric vehicles when talking about automotive innovation. Studies show that those who are engaging in online discussions or posting about automotive innovation are much more likely to be interested in hybrid and electric vehicles than the general population. A 2016 report from Mintel’s New Cars – Canada showed that nearly a quarter of Canadians 18-24 years old are considering a hybrid/electric car for their next vehicle. Making relevant posts to your Social Media platforms is an easy powerful way to promote your product. If you want to learn more about how to be successful on Social Media, contact us today! Worldwide Digital and Mobile Ad Spending is on the Rise! After eMarketer’s latest update to their 2015-2020 forecast, the key points put focus on the growing spend and digital and mobile’s impact. They are now predicting that ad spend is going to rise faster than previously expected. Having grown to $550.51 billion, global ad spend saw an increase of 7.2% in 2016. Digital ad spend is set to climb 20.3% to 194.60 billion for 2016. The increased jump is due to the recent Summer Olympics in Rio followed by the US presidential election. From 2015 to 2020 ad spend growth is expected to maintain between 5% and 9% increase per year. eMarkerter also expects that by 2020 $724.06 billion will be invested in advertising. We were lucky enough to attend Google’s Video Ignite event at the New York Chelsea office. It was a great event packed with a ton of useful content that we would like to share with you! Does your video appeal to users in a way that will encourage them to share you video? Having great content is key, and here are a few things to keep in mind when developing a strategy for your video: is it topical, is it valuable, and is it relatable? Is there an element of your video that speaks directly to your viewers? This could be content added in the main video or as supplementary content. Think of calls to action and video descriptions! Are you able to incorporate your viewers into your content? Are you able to spark a conversation in the comments section and get them involved with what you’re doing? This is probably the hardest fundamental: updating your video content regularly. We all get busy and forget to make time. Having a schedule and specific video format in place will be key. You also want to make sure you’re portraying the right personality and voice in all of your content. Do you have a clearly defined audience? You can set your targeting at the video level, show level, and even channel level. Targeting your videos will give you more opportunity to speak to different audiences. If the audience loves it, can you make more of it? Meaning, if you spend $40,000 on a video that everyone loves, do you have the resources to keep making videos to that level? Can you continue to hire the right crew for your video? Will your content be found? Not every video can go viral, but are you choosing topics that are trending or evergreen (like how-to and DIY videos). Go check out google.com/trends to kick-start those creative juices! Can every single video be appreciated by a brand new user or do they need to sit there and watch multiple videos to understand what you’re trying to get across? If you want your content to be shareable, you will want to make sure it’s accessible as well. Is there a way to feature guest stars? More and more viewers are relating to YouTube Creators as being more like them compared to traditional celebrities. This means that they take their opinion seriously! Is the idea for this video coming from a genuine place of passion and does it fit your overall brand? You want to create unique content that aligns with your brand identity and excites your viewers! Karolina and her team researched the top performing YouTube channels and found that they all incorporated a combination of these 10 fundamentals which were key to building their success. We’re not suggesting that you need to incorporate all 10 of these items in every single video, but keeping 2 – 3 in mind is definitely a good place to start. If you’re looking to get some videos created and would like some help coming up with a strategy, don’t hesitate to give our team a call! In March 2016, Google came out with a case study that highlights how the modern car buying process predominantly involves digital interactions, 71% of which occurred on mobile devices. In November 2015 they stated that 1 in 4 car buyers turned to mobile every day to do research on vehicles prior to purchasing. Google’s 5 big moments should be something all digital marketers think about, which is why I think Facebook is an advertising platform that will strengthen any marketing efforts if executed properly. Facebook has over 1.65 billion monthly Facebook users1 and that number grows each year. On average, users spend approximately 20 minutes on each Facebook session2. In Canada, about 21 million people are on Facebook and about 16 million of those users are on Facebook every day. Just the sheer amount of daily users should be enough to consider advertising on Facebook, and we haven’t even gone into the features and tools that help you get more leads and engage potential and past customers. Not to mention, you’ve probably heard more than once that everyone is always on their phone. Well, 1 out of every 4 minutes spent on mobile is spent on Facebook and/or Instagram. If you want to compete and get ahead of your competitors you should be where people spend their time – Facebook. Not only will people be familiar with your brand, but the people who are truly interested in purchasing will interact with you on Facebook. How, you ask? Your ads can generate website or page traffic which can result in a lead. Competing to engage with people interested in makes or models outside of your own. Facebook allows users to fill out a form directly on the app or website. The third point should stand out the most. Facebook has lead ads that allow users to fill out a form quickly through Facebook. You don’t even need to worry about a form being too long. Facebook pre-populates their info reducing the time it takes a user to fill out a form. Which means you get all the information you need to get more qualified leads. Want the best strategies and optimizations for Facebook and Google? Contact one of our Strathcom Online Marketers to learn more. Digital Advertising is becoming the new norm – this marketing channel has rapidly developed into a preferred advertising channel and shows no signs of slowing down. Companies love digital marketing because of its ability to be targeted, engaging and easily measurable. You know your outreach is going to people who want your information, you have the ability to reach your audience when they are on-the-go, and the metrics of digital advertising are built right in so you can see how the channel is adding value. Google is definitely the leader of the online advertising realm with millions of Canadians using Google every day to search the web. Act now! Hurry! Low Stock! Only a few items left! Creating a sense of urgency during the sales process is a common practice in marketing, but is very underutilized in the automotive industry. Take a look at your current website and ask yourself, am I creating a perspective sense of urgency that encourages potential customers to buy now? Are your customers aware that if they don’t act promptly, they may lose their chance to buy the product, or to benefit from the promotional offer? This practice works well, if executed properly. Here’s how you can generate a sense of urgency to increase your sales and online conversions. Dealerships have a great opportunity to use the scarcity effect on their websites. When an item is perceived as being limited, the desire to have that product will increase due to the inherent fear that people have of missing out. Leverage this by providing instantaneous alerts on inventory and let customers know when the stock level is low. This week only! Exceptional price! You have 3 days and 4 hours to take advantage of this offer! Add a countdown to your VDPs to remind users that your offers are temporary and perishable and that they should buy before the end of the countdown to take advantage of your deal. The search results on Expedia’s website prominently displays a “Daily Deal” function with a timer. This fuels the urgency and encourages visitors to act fast! Show visitors the popularity of your vehicles. The popularity of a product decreases consumer uncertainty and increases demand as a result. When an item is perceived as being popular, the desire to have that product will increase. Creating a sense of urgency doesn’t need to be complicated. If you have a website with Strathcom Media, you will have access to the tools that can achieve this for you. The result? An increase in your customers’ confidence levels in your product, and the creation of a sense of urgency that will successfully spur people to convert their interest into a purchase. What are you waiting for? Join companies like Amazon and Expedia and start creating conversion producing urgency now! Testimonials: Are They Still Relevant? Are your website or marketing campaigns failing to generate business? How do you convince uncertain buyers that your product and services meet their needs and expectations? How do you persuade them that they are right to call on your services and right to trust you? One of the most effective ways to persuade a potential customer is to show credible testimonials. How often do you hear the following statements: “I’m not much of a car person”, or “I don’t know much about cars”. Now, put yourself in your customer’s shoes. What do you do when you need to buy a product you don’t know much about? What is your initial reaction when you are searching for an expensive product or service? According to Google’s Think Auto data, 48% of people consult the internet for vehicle information, and 25% consult their family and friends for this information. This is because prospective clients want to mitigate as much risk as possible. When we are faced with a tremendous amount of vehicles to choose from, we all want to make the “right decision” and avoid making a purchasing mistake. Loyal customers have a story to tell. Give someone who has already made a similar purchasing decision a chance to tell their story in front of the cameras and showcase what’s great about your dealership. These testimonies will play a huge role in reassuring customers of their decision making throughout the buying process. That being said, not all customer testimonials are created equal. Unfortunately, many false recommendations circulate on the web, which makes it even more important to make sure your customer testimonials are credible and authentic. Once you are ready to reap the benefits of a strong video testimonial, get on YouTube! This medium is greatly underutilized by Canadian car dealers. The potential to drive a lot more traffic and inexpensive pay-per-click rates are the two components that make YouTube a great tool for delivering video advertisements. And guess what? Here at Strathcom Media, our automotive video production team will come right to your dealership with the proper equipment to produce high-quality videos without disrupting your day-to-day operations. All you need to do is have your vehicles (and any featured customers) detailed, polished, and ready to film. We will edit your videos to your satisfaction, and then optimize them for search engines to help you get the most views possible. Check out one of our testimonial videos below! If you write content, any kind of content, you probably wonder whether or not your copy is going to persuade someone to complete your desired action or conversion. The tips I’m going to share can be used for longer copy, but I mostly apply it to ads, Facebook posts, and landings page content that I write for increased conversion rates. Here we go! Use you/your/I as much as you can. Especially if you’re posting in Facebook using your organization’s profile, you’re speaking to people – not another organization. Being personal will make your people feel like you’re another individual speaking directly to them, rather than a faceless corporation searching for sales. Sometimes we think that we have to be creative, but you don’t always need to be. Your writing sales copy just needs to resonate with the person reading your content. As long as you’re accomplishing that you will see better results than if you focused on writing something unique or original that no one else has written about before. Appeal to people’s emotions. Then hit them with your rational argument. Popular emotions to appeal to are pride, fear, laziness, and approval. Rational arguments to make could be cost effectiveness, profit, and savings. This is a North American thing. It won’t however be the same across the world, like in Europe, they might react better to headlines without the capitalization. You’re probably only reading this blog because the headline caught your eye, and it resonated with you. Spend most of your time thinking of a heading rather than the actual content. I spent 1/2 of the time working this headline with my colleagues and the rest on writing the content. So follow these five tips in all of your ads, blogs, and social media posts, and soon you should notice greater reader retention and better conversion rates as a result! We hope we have you convinced by now that your dealership should be on Instagram and that it’s important to your brand development. The insane growth of the app presents a great opportunity to define your brand and increase your presence on the mobile network. With over 400 million users worldwide, Instagram has now surpassed Twitter as the largest mobile photo-sharing app in the world. Considering the amount of active Instagram users, it should be easy to collect a significant following in your area with some simple hashtags and nice pictures–but your dealership account can’t seem to break 10 Likes or increase followers. Instagram is so much more than a Valencia filter and #yeg. Let us help you get past the 5 mistakes you might be making and that you don’t want to throwback to. When a customer searches for your brand, there is nothing worse than for them to land on a private account. This makes your brand appear closed and selective, and customers do not want to be granted permission to view what you have to offer. Public accounts allow you to be easily accessible and approachable, and give them a visual glimpse of your brand. It’s also important to fill in the Bio section of your profile. Use keywords to help customers find you, and include your website to encourage visits and leads. Maybe you aren’t using enough hashtags for interested customers to find you, and this means fewer interactions with your posts. More hashtags equals more Likes and comments, and Instagram allows up to 30 hashtags per image. Start by testing 5 different hashtags per post until you’ve collected a significant amount of tags to use in every post and guarantee results. Like on Facebook, users on Instagram want a glimpse into your brand, and to interact with whatever posts interest them. By replying to comments on your posts, you are demonstrating you’re a dealership that’s excited and committed to customer interaction and service. Instagram is a great platform to promote any deals and specials running at your dealership. However, your profile should not be cluttered with promotional images that overshadow any of the personal content you post. Limit promotional posts to once a week, or get in touch with our team to start Instagram Advertising. Like with other marketing tools you use at your dealership, always have a plan for what outcomes and goals you want to achieve through Instagram. Is it to promote a lifestyle or community engagement? Avoid random posting, but also make sure you have a consistent schedule for when and what content you plan to post to your account. A picture is worth a thousand words, and we can ensure these words are being heard. Instagram is not your grandparents’ social network, and you can turn hashtags into dollars for your dealership. Contact Strathcom Media today to find out what we can do to improve your Instagram presence! A few months back, Instagram hit 400 million users, making this mobile photo-sharing app officially larger than its rival Twitter. The growth in user-base isn’t slowing either, as it only took nine months for Instagram to achieve its last 100 million users. If you are already leveraging social media platforms, you are more than likely using Facebook and maybe even Twitter. But you have ever thought to use Instagram to engage with your customers and develop brand awareness? Today, companies are increasingly turning to Instagram to engage consumers and boost their image. SHOULD MY DEALERSHIP BE USING INSTAGRAM? We have all heard the expression: A picture is worth a thousand words. The use of images is a great way to tell stories, and stories are much more effective in engaging people to generate an emotional response. Instagram is a great opportunity to differentiate yourself in the marketplace by expressing experiences that define your brand. In this video below, you can see how the Instagram’s advertising tool (carousel ads) gives brands the ability to create a story using photos. Use Instagram to increase demand by showing customers some highlights features of each model. Initiating an Instagram contest can work wonders in engaging your customers. For example, users can share photos of them in their car or using cool features. If you would like to highlight your service department, show the impact of your work before and after. Consumers are often daunted by the car buying experience. Performing a campaign highlighting the staff of your different departments within your dealership will help put a face to your brand and put consumers more at ease when they come for a visit. Share “teaser” photos to satisfy the consumer’s curiosity and to create anticipation for your new model launches. Remember to use popular and trending hashtags. This will make it easier for users to find your Instagram campaigns. Highlight a customer’s post-purchase satisfaction. Customers have a story to tell so give them a chance to tell their story in pictures and showcase what’s great about your car dealership. These images will play a huge role in reassuring customers of their decision making throughout the buying process. Does managing an Instagram campaign still seem like a daunting task? Are you still unsure of where to start your campaign? Let Strathcom Media help you leverage this major social media outlet so you can better connect with your customers. Contact us today to find out more about our popular Instagram package. Since 2013, many big brand companies have been taking advantage of Instagram’s 400+ million member community by sharing high quality, image-rich content while driving results that matter. Thanks to the great success of these campaigns, Instagram has opened up their advertising product to all advertisers, internationally. No brand, budget or idea is too small to take advantage of this next wave of social media advertising. What do you get when you take 160,000 people and stuff them into San Francisco for a week? One of the largest software and technology conferences in the world: Dreamforce! Internet managers have it tough. When you work in such a new and constantly-evolving field, half of your job is spent justifying your job. Show a dealer how your Next Biggest Thing Ever affects the bottom line, and they don’t need much more convincing. That’s where the URL-shortening service Bit.ly comes in. If you aren’t currently tracking the engagement with your posts, it’s time to sign up for a free account. Bit.ly offers a variety of services that will help the Internet manager streamline and track their social media engagement. But for this post, we’ll focus on the most important three. 1. URL Shortener: Rather than have a 3-line link clogging up your Facebook posts, or using all 140 characters of your Tweet on your link extension, you can shorten it with Bit.ly. Do you like it when friends neurotically ramble on after telling a story? I didn’t think so. A shortened link is like a confident, punchy quote; it’s much more likely to attract clicks while providing you with more space to write a description. 2. 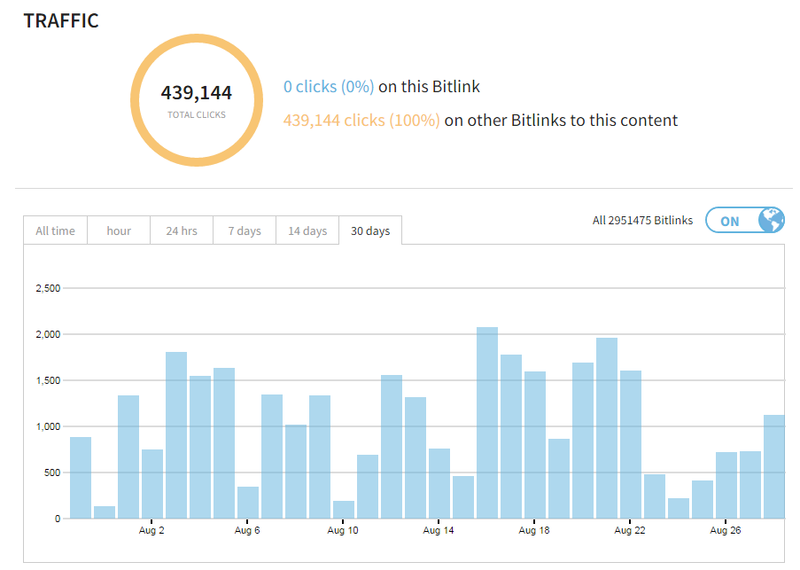 URL Tracking: The Bit.ly tool’s bread and butter is its ability to track clicks on the link; you can see daily engagement, geographic area, and much more. If you’re sharing your content all at once on Facebook, Twitter, Google+, LinkedIn, and your personal modeling blog, when you look at your analytics reports, how are you going to know what traffic came from where? If you’re in a hurry and need to drop one or two sharing sites, which ones should they be? With Bit.ly, now you know. It will also give you a better idea of when users engage with your posts the most, giving you the chance to schedule your posts for the strategically optimal times. If nothing else, this gives you a bit more confidence behind your suggestions at the next marketing meeting. 3. URL Engagement: Now you may know which sites are giving your posts the most attention, but ever wonder who on Facebook or Twitter is engaging with and sharing your posts? That’s right, Bit.ly has you covered here, too. It provides you not only with the clicks to your shared link, but shows you anybody else who shared the link, as well. Now you can see which users are driving the most engagement to your content. If it turns out that there are a handful of people who are responsible for 90% of your social media shares, well now you know who to target and take more seriously. If all of your clicks come from your Internet manager’s mother, now you know that, too. Bit.ly allows for a fast and free approach to tracking social media campaigns. So when your General Manager asks for results, you’ll have one of those graphs with a steadily increasing trend line to queue up on the projector. Just make sure to include big dollar signs in the margins. Paid advertising on Facebook is getting more expensive. How much more expensive is it? It’s so much more expensive…that it’s about 10 percent pricier than it was at New Year’s. (*crickets*) Between more dealers recognizing the advantages of targeted Facebook ads, and the company’s recent redesign of their News Feed that limits paid content to 5% of total News Feed items, those surefire search terms of old are becoming more of a luxury. What does this mean for your Facebook marketing strategy? Some cities have very high rents; that’s in part because a lot of people really want to live there. Facebook advertising works in the same way, and now the competition is boosting up prices. Just make sure you don’t blow your whole budget on promoted content just because all the rich kids want to. At Strathcom, we recommend that you don’t put all of your eggs in one basket. Keep a close eye on your vital marketing metrics (like total cost per new customer) and make sure your ROI is still within an acceptable range. Meanwhile, don’t overlook your other promotional avenues, and opt for a well-rounded campaign that aims for market penetration and growth. For a free audit of your current marketing efforts, contact us now at info@strathcom.com.